Once you’ve replaced those bulbs, leave the lights on if you’re leaving a room for only a short period of time. According to the Department of Energy (DOE), “Fluorescent lights are more expensive to buy, and their operating life is more affected by the number of times they are switched on and off, relative to incandescent lights. Therefore, it is a cost trade-off between saving energy and money by turning a light off frequently and having to replace the bulbs more frequently.” The DOE says that the general rule-of-thumb is that you should turn off a fluorescent light if you plan on leaving the room for more than 15 minutes. Install (or ask your landlord to install) a programmable thermostat - Instead of having to remember to lower the temperature before bed or when you leave the house for work each day, let your thermostat do the heavy lifting for you. If your landlord won’t spring for it, you can purchase a programmable model yourself for as little as $25. 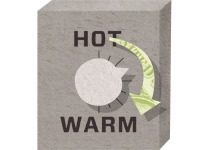 You’ll save one percent of your heating bill for each degree you lower your thermostat over an eight-hour period. For example, if you program your thermostat to lower the temperature by five degrees when you head out for work, you can save five percent of your heating costs. While you’re at it, consider turning down the temperature a degree or two while you’re home—channel Jimmy Carter and put on a sweater. 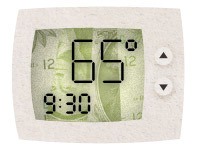 A properly programmed thermostat can save you $150 per year. 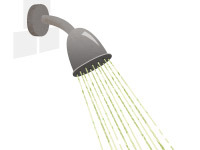 Install a low-flow showerhead - By using a low-flow showerhead instead of a regular showerhead, you can achieve up to 60 percent water savings. That means you’ll be using less hot water, which equates to less energy used for water heating. And the great thing is that you can take the showerhead with you when you move to a new place. (Just make sure to re-install the old one before you go.) Side benefit: You’ll also lower your water bill. Turn down the temperature on your water heater - If you have access to your water heater, check the temperature setting. For most people, setting the water heater to 120˚F is sufficient to be toasty warm in the shower. Many water heaters are set to 130 - 140˚F by default, and you can save 3 to 5 percent on energy costs for every 10 degrees you reduce the temperature. Side benefit: You reduce the risk of scalding yourself. Use window coverings to your advantage - In the winter, use the warming effects of the sun to your advantage by opening up the curtains on windows that receive direct sunlight during the day. Then make sure you close them up again at night (leave them closed during the day on windows that don’t receive sunlight). 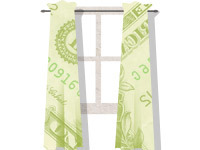 According to the DOE, “most conventional draperies can reduce heat loss from a warm room up to 10 percent.” Lined drapes will be most effective. For a little extra reinforcement, install plastic window films to your windows during the colder months to cut down on the amount of air leakage through your windows and window frames. Rearrange your furniture - Clear your heat registers and radiators of any furniture that might obstruct the flow of hot air into your rooms. You can also make your own heat-resistant reflectors to place between radiators and walls so you’re not wasting energy by heating the wall—or, as is the case in many Philly properties, losing heat through un-insulated exterior walls. All you need to do is get some thin wood board from any home improvement store, cover it with reflective bubble insulation (also available at home improvement stores) and anchor it to the wall behind the radiator.